Top Areas where Android App Development has taken Gigantic Boom in 2018 & will surely grab the market in 2019. Smartphone becomes an essential part of our life. From waking up with a morning alarm, using WhatsApp, reading the news, listening to music, watching YouTube videos, to checking emails etc. Everything is seamlessly executed from our mobile devices. Approx 2.32 billion people are using Smartphones in which 2 billion people are Android phone users because, since 10 years Android has been acting as a major platform for Smartphone across the globe. Due to these rising facts, most of the businesses are focusing on developing business applications. Is creating an app is enough for the targeted audience? No! Since the Mobile users are smarter and they have many points to reject the app due to their designing, functionality or services. Right from the starting of the year 2018, until now, it was a phenomenal year for Android App Development. In this year, top mobile app development companies have focused on important trends to enhance the app designing, functionality & app services. And guess what? They have succeeded and also generated high revenues from the android app development services. Sometimes you need an app that you have to use for a single time. And due to the mobile internet connection problem, you cannot install it. Google announced, Android Instant Apps to provide users with quick access to apps. The new technology is gaining a stronger standing as it now allows users to instantly access and use the apps without requiring to installing them on their devices. This allows them to save their phone memory as these apps are not actually stored on their devices but are sourced and retrieved from a shared facility that isn’t device dependent. Through the amazing functionality of Android Instant Apps, it has gathered huge appreciations among users and helped android app development to become a revenue-generating & high downloaded apps platform in 2018. The predictions say that Market for Android Instant Apps in 2019 will be in highlights and Android Instant Apps are going to be more popular & profit yielding in coming years. The Artificial Intelligence and Machine learning are the major breakthroughs for mobile app technology in recent years. The integration of AI enables the apps to easily tackle the complex processes along with additional skills. With the help of machine learning, the developers can make their apps smarter than for the users. The products like chat-bots are already using the technology for understanding human behavior for better interactions. Deep Learning: This method of machine learning helps the computer systems to imitate the human brain with the help of neural networks. Capsule Network: Improved for of neural networks that help in maintaining the hierarchical relationships. AutoML: This is specially developed for the business applications. The owners can build machine learning model for their business with AutoML without the use of complex programming environment. The inclusion of AI & Machine learning technologies has made android app development highly approachable mobile app development services in 2018. It will boost the different business in coming years too. Well, in 2018 the problem of storage capacity in Smartphone’s memory has been resolved by adopting a useful trend named Cloud computing. I guess, almost every person right from users to technical brains has heard about cloud technology. Cloud has found its place in android app development. Implementing cloud computing in android app development process made the task easy for users to fetch the data directly from the cloud & take minimum space in their Smartphone internal memory. Globally, cloud apps will drive 90% of total mobile data traffic by 2019, and Mobile cloud traffic will be 11-fold with compound annual growth rate (CAGR) of 60%. A prediction says that the number of connected devices will witness a booming growth in the coming years. By 2020, there will be as many as 30 billion connected devices. This activity has directly impacted the android app development trends as IoT devices are majorly controlled by Smartphones. In 2018, IoT with Android Apps has grabbed the eyes of the users and in result approx 60k people search for the smart home devices every month on the search engines. Android Apps equipped with the IoT compatibility will be preferred by the users in the coming years too. 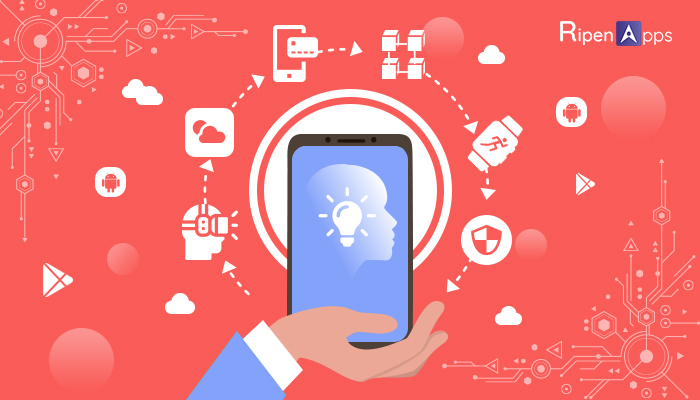 In order to lead the mobile app market, app developers need to make sure that their Android App must utilize the IoT to grab a maximum number of user’s attention. Most of the android app development company thinks app search seems like nothing serious for them. But they are wrong because implementing search option in app helps users to find any content easily on the app. Google integrated this feature into popular apps like Spotify, Gmail, and YouTube. So, it is clearly showing the success of in-app search in Android App services in 2018 and finding it more convenient, users will surely go with this in coming years too. Another trend that is making it big in the Android app development space is that of Kotlin. A new language that was introduced in early 2016. From Android developer’s point of view, Kotlin is an easy and concise language, & has a lean syntax that is easy to learn. This is the reason that developers are willingly exploring its potential even as it is still in its evolutionary phase. In this year there are huge inclination has seen towards Kotlin and this inclination predicts that the coming years will also adopt Kotlin for Android App Development. In past, Google received a lot of complaints about breached app security, because it takes user personal data without asking for any permission. In the Android update, 6.0 Google launched a new updated security breached app. It enabled android app developers to integrate the permission module under the breached app to make user’s data more secure. From this inclusion, the app will only access your data when you say yes to them. This trend has resolved the issue of data security and has gained popularity in recent years. Have you heard about that popular game “Pokemon Go!”? Yes, that popular game which surprised the mobile gaming industry in 2016 through its huge number of downloads around 650 million. The game became the most popular game in Android PlayStore. The game is based on AR & VR technologies. As per a Statista report, there are around 977.9 million standalone AR app downloads in 2018 till now. The figure can reach 1,389 million by 2022 & inclusion of VR in mobile apps will increase customer engagement in the future. In 2018, these technologies have shown their best-in part and expected that both technologies would significantly contribute to the android app development in 2019 also. When it comes to android app development, canny software developers cannot rely on the outdated trends and tools. To get maximum conversion through your app, you have to modify development skills according to the latest trends. And trends that were adopted by the Android developers in 2018 have returned app developers as well as users a lot of benefits. With a strong belief that inclusion of mobile technology and digitalisation of processes for any individual or a business will help them to ease their life so that they can be more focused on their Core Business functions, with this intent and an experience of 6+ years our service ranges from consultancy to build next-generation mobile applications for Entrepreneurs/Startups to Enterprise Businesses. Our goal is to provide optimum quality services to our clients at the best reasonable price in the market.